Selena Perry is content with her life. At least she is now. She has a job she enjoys, even though it’s a bit on the morbid side according to some. A place to call her own. And past that’s as close to a distant memory as its going to get. If loneliness grips her heart and tries to squeeze the life out of her from time to time, she can deal with it. Well, as long as her furry little companion Felix keeps visiting and bringing with him a small slice of peace and happiness. He’s the only one in her life that hasn’t tried to beat her down mentally or hurt her physically. He’s a soft, quiet rock of support in what used to be her unstable life. Malcolm Turner is a Thaloc, a shape shifting being able to take various forms of his choosing. But more importantly, he is Selena’s familiar, the one she calls Felix. He is her watcher. Her protector. Her future. And her forever. When the time is right he’ll reveal himself and the role she will play later in life. He’ll bring her into the coven where she will take her rightful place by his side. He’ll introduce her to a world she never knew existed and the one she is destined to save. The time to reveal himself comes sooner than Malcolm ever imagined when Selena is attacked while walking home from work. 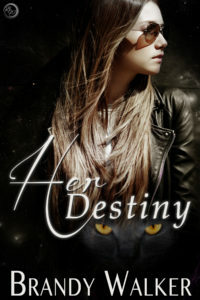 With her traumatic past and distrust of most everyone, will his transformation from back alley Tomcat to devoted lover push her away or will it help her see Her Destiny? First seen in the Shifters Gone Alpha box set. A shadow drifted across the brick wall as Selena Perry made her way home. Four little legs and a long, curled tail were superimposed larger than life next to her. Felix, her stalker, was back. A bubble of happiness formed in her chest. She was forever concerned he wouldn’t show back up after the weekends she didn’t work. Worry would gnaw at her, and she wondered what he did on the days she didn’t see him. She could only guess he prowled around somewhere between her job at the morgue and home. He popped up at different places and different times each day. Felix meowed, calling out to her, pulling a smile to her face. Okay, so maybe Felix wasn’t his real name. She’d given him the first one that popped into her head. A flashback to the cartoon she’d watched at her grandmother’s house while she waited for her mother to show back up after the summer break. He didn’t have a collar. No tinkling tag or bell sounding with each soft step. She had no idea if he’d been chipped, as she couldn’t get close enough to pick him up and take him to a vet. Every time she got near, he slipped away, as if he knew what she had in mind. She guessed she wouldn’t want a trip to the vet either if she were a free-roaming, wild cat. He probably had a bad experience when he was a kitten, driving him to run away. It didn’t matter in the long run that she couldn’t catch him. He was there and that was what mattered. His presence reminded her that she wasn’t alone day after day as long as he trailed behind her. Her tiny guardian, a dash of superstition to ward off unwanted attention. It was surprising to see how many people would cross the street to avoid the little black creature. Felix meowed, dashing forward to weave between her legs. His warm body pressed up against her. His deep purr vibrating through her jeans making her laugh. Felix’s soft meow reached her ears, sounding much like an apology. A companionable silence fell over them as they walked the three blocks to her apartment, the first light of day guiding their way. It may not be company of the human variety, but it was a step better than what she had during the night. Once they reached the old brick building where she lived, Selena let herself in and climbed to the third floor. Her companion would be dashing to the fire escape to wait at the window for his morning bowl of milk. It was their ritual on the days she worked, a little special time to spend together where she talked and decompressed before heading to bed. It was funny that people who worked at night spent most of their off time in bed. It always felt like there wasn’t enough time to sleep and have a life outside of work. Not like day workers. Felix was already sitting at the barely open window waiting for her when she unlocked her door. Crossing the room, she made a beeline for the fridge, grabbing up his bowl from the drying rack. It hadn’t taken long to figure out he was an impatient little thing. Typical cat. Humans just couldn’t move quickly enough. He mewled, poking his tiny nose and paw under the window frame. “Hold on buddy. You know it takes me a minute to get it ready. You don’t like it cold. Remember?” She heated up his milk, tapping a tune out on the counter with her fingers as she stood by. The first time they’d played the feed the kitty game, she’d poured milk straight from the carton and set it on the sill. He turned his nose up at it, waiting until it warmed in the morning light. She watched in fascination, as he dipped his dainty paw in, testing the temperature every few minutes until it got to his liking. She adapted to his preference to save him time, even though she preferred he stay longer. But she knew her kitty had things to do and people to see, and she didn’t want him to decide to go somewhere else for his morning grub. He was one of the best friends she had. He didn’t turn every conversation back to him and he listened without complaint. The microwave dinged and she took his bowl to him. She lifted the window, allowing fresh air to filter into the room, stirring the staleness that settled in while she was gone. As she set it down, his rough little tongue made contact with her hand. She smiled at the little sign of affection he showed. That had taken even longer to get from him. His suspicious little nature took months to overcome. “Thank you, Felix,” she said as she made her way back to the kitchen. Pouring a bowl of cereal and milk, she joined him for breakfast. Perched on the arm of the couch, she watched him lap up his treat. Felix shot her a look filled with disdain. He turned his attention to something outside. Rebuffed again. It wasn’t the first time he’d ignored the invitation to curl up with her. One of these days he’d give in. She was sure of it. “Your loss,” she sang, walking away. She kicked her shoes off, then peeled her jeans down, leaving them where they fell. It wasn’t like she had to make the place presentable while she was asleep. She wasn’t a total slob though. She just lacked the energy to be bothered with it at the moment. She’d pick it all up after a couple hours of sleep. She tugged her T-shirt off, tossing it on the floor as well. Felix’s soft meow pulled her gaze. He sat on the sill; head poking in and cocked to the side, his intelligent eyes focused on her. He meowed again, stood and brushed up against the window frame. Suddenly, he turned and left without a backwards glance. Laughing, Selena headed off to the shower. It was time to wash the grim of the morgue off and get some sleep before she had to get up and do it all over again.